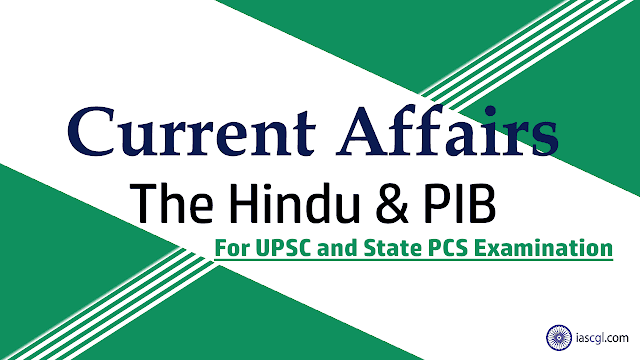 Current Affairs and News Analysis for UPSC Civil Service Examination and State Civil Service Examinations. The Cabinet Committee on Economic Affairs (CCEA) approved the umbrella scheme which comprised of ocean services, technology, observations, resources modeling and science under the O-SMART nomenclature. What is O SMART ? The services under this O-SMART will provide economic benefits to a number of user communities in the coastal areas, namely fisheries as this will help in reducing the search time for fishermen resulting savings in the fuel cost. Currently, five lakh fishermen communities are 1receiving this information daily through the mobile, which includes allocation of fish potential and local weather conditions in the coastal waters. Apart from this offshore industry, coastal states, defence, Shipping, ports are also set to reap the benefits from it. O-SMART will provide economic benefits to a number of user communities in the coastal and ocean sectors, namely, fisheries, offshore industry, coastal States, defence, shipping, ports, etc. the setting up six desalination plants in Lakshadweep. India already has a tsunami warning system in place. Implementation of O-SMART will help in addressing issues relating to Sustainable Development Goal-14, which aims to conserve use of oceans, marine resources for sustainable development. This scheme (O-SMART) also provide necessary scientific and technological background required for implementation of various aspects of Blue Economy. PANEL of senior government officers, which deliberated on the possibility of enacting a new law to check incidents of lynching, has submitted its report to a Group of Ministers headed by Home Minister Rajnath Singh. The committee of secretaries, headed by Union Home Secretary Rajiv Gauba, held consultations with a cross-section of society and other stakeholders before submitting its report to the GoM. What is in the report? In May and June, more than 20 people were lynched based on fake posts or rumours floating on various social media platforms. Social media platforms needed to act in a “time-bound” manner. Social media platforms should be made accountable for not blocking malicious posts and videos when brought to their notice and an “FIR could be lodged against their country heads” for not complying with government orders and they could be prosecuted under law. Creation of a portal where people can report such videos and content and that will be forwarded by the National Crime Records Bureau [the nodal body] to the States concerned for appropriate action. Officer in each district at the level of Superintendent of Police and special task force to be set up to gather intelligence, and closely monitor social media contents to prevent mob attacks on people on the suspicion of being child-lifters or cattle smugglers. At the fourth ‘Google for India’ event, the internet search giant unveiled Project Navlekha — its new initiative to bring India’s 135,000 Indic language publications online in a hassle-free manner. Google has unveiled Project Navlekha to make online content relevant for more Indian users especially in local languages. Google is using its expertise in artificial intelligence for Project Navlekha, using which, it will quickly render any PDF with Indian language content into editable text, overcoming issues that usually occur when you try to copy text in Indian languages from a PDF. The project aims to bring 135,000 local language publishers online by making web hosting smooth and simple. It will allow local publishers who do not have websites to make their offline content fit for online publishing in less than a minute. It also comprises tool that uses Artificial Intelligence (AI) to allow publishers to simply scan documents or PDFs and create instant web pages on the platform. The project will provide a handy online publishing tool for local language newspapers and content companies—90% of which do not have a website. The registered publishers on Navlekha will also be provided with free web hosting, along with a branded domain for three years. They’ll also have AdSense support to begin monetising their content. Under Navlekha project, Google will help these publishers to receive training and support and a branded page domain for the first three years. The Bay of Bengal Initiative for Multisectoral Technical and Economic Cooperation (BIMSTEC) summit in Kathmandu this week, which Prime Minister Narendra Modi is scheduled to attend, will be another milestone for India after the BRICS-BIMSTEC Outreach Summit hosted by it in 2016, as the grouping has gradually emerged as a key vehicle to take forward India’s regional, strategic and economic interests. India is expected to face challenges from both within and outside, in terms of policy dilemmas. Contribution - India is currently the largest contributor to the BIMSTEC secretariat’s budget. Its annual contribution was Rs. 2 crore (32% of the total secretariat budget) for 2017-18. The secretariat plans to strengthen its capacity by increasing human resources and number of officials representing each member state. Given this, India may need to consider allocating more resources. India’s generosity would be a key test of its commitment to the sub-regional grouping. Supremacy - India would have to counter the impression that BIMSTEC is an India-dominated bloc. This is also a problem that it faced for a long time in SAARC. But today, many smaller neighbours are willing to engage with India to benefit from its economic rise. Nonetheless, for internal political reasons, the dominance issue may re-emerge and pose hurdles. To moderate such suspicions, India will need to show sensitivity to the concerns of smaller neighbours. China - China has long desired to be a part of the SAARC grouping. It has observer status in SAARC, which only increases demands for it membership. Some countries have their own interests in bringing China as they look to balance India’s dominance. Most of these challenges for SAARC can potentially re-emerge in BIMSTEC as well. So India will have to carefully handle the emerging regional geopolitics. 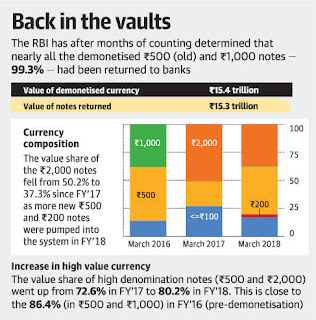 The Reserve Bank of India’s annual report for 2017-18 said more than 99% of the Rs. 500 and Rs.1,000 notes, which were withdrawn from circulation in November 2016, had been returned to the central bank. The central bank said the processing of the withdrawn bank notes has been completed at all centres of the Reserve Bank. Cash has come back into the system, electronic payments also registered a healthy growth, RBI data showed. The share of electronic transactions in the total volume of retail payments increased to 92.6% in 2017-18, from 88.9% in the previous year with a corresponding reduction in the share of paper-based clearing instruments from 11.1% in 2016-17 to 7.4% in 2017-18. Prepaid payment instruments (PPIs) recorded a volume of about 3.5 billion transactions, valued at ₹ 1,416 billion while mobile banking services witnessed a growth of 92% and 13% in volume and value terms. The number of registered customers rose by 54% to 251 million at end-March 2018 from 163 million at end-March 2017, the RBI said. On 8 November 2016, the Government of India announced the demonetization of all 500 and 1000 banknotes of the Mahatma Gandhi Series. The government claimed that the action would curtail the shadow economy and crack down on the use of illicit and counterfeit cash to fund illegal activity and terrorism. The sudden nature of the announcement and the prolonged cash shortages in the weeks that followed created significant disruption throughout the economy, threatening economic output. The Economic Survey says that India’s GDP is set to grow at 7 to 7.5 percent in 2018-19. This is an increase from its prediction of 6.75 percent growth this fiscal year. The Economic Survey has cited exports and imports data to claim that the demonetisation effect was now over. It claims that re-acceleration of export growth to 13.6 percent in the third quarter of Financial Year 2018 and deceleration of import growth to 13.1 percent is in line with global trends. This suggests that the demonetization and GST effects are receding. Services export and private remittances are also rebounding. According to the statistics released in the Survey, the Demonetization had led to Rs 2.8 lakh crores less cash (Equivalent to 1.8% of GDP) and Rs 3.8 lakh crores less high denomination notes (Equivalent to 2.5% of GDP) in the Indian economy. The Economic Survey has also clarified that income tax collections have touched new high with demonetization and introduction of GST. From about 2 percent of GDP between 2013-14 and 2015-16, they are likely to rise to 2.3 percent of GDP in 2017-18, a historic high.